Many of us are operating under the mistaken belief that only a few people are artists. The truth is that everyone is born with some degree of artistic ability. The difference between the artists and the non-artists is nurture. So how can we nurture our children's natural artistic interest? 1. Decide that you will nurture artistic interests. It's very easy for those of us, who never had art instilled into us, to neglect this point. Don't. You can teach art even if you have no artistic talent. 2. Provide an atmosphere for learning. Our children must feel free to learn and explore their interests, whatever they are, to the fullest. 3. Make your home a place of beauty. You needn't be rich or have pricey things. The idea is to provide an environment that delights the senses. Nice prints on the wall, vases of flowers, hanging plants - beauty. 4. Notice the art all around you. Attending museums and festivals is a great way to develop art appreciation, but art can be found in the everyday things, too. A walk on a beach or a nature hike provide much beauty to be seen. Noticing little bits of art in stores, on the sides of buildings, and at street fairs bring art into the everyday. 5. Provide art supplies for your children. All the art exposure in the world will not nurture a child's desire to create if there are no basic art supplies on hand. 6. Have resources on hand for you. If you're short on ideas or don't consider yourself to be the artistic sort, it certainly comes in handy to have some art resources at hand. 7. Follow your child's lead. If the child is interested in a particular technique or activity, follow that interest. If the interest fades, let it go. If it' continues, continue to encourage it. 8. Help them learn techniques. Learning about artists and their works is one way of picking up some ideas for this. Getting your hands on how-to art books or taking an art class is another. 9. Honor your child's work. Twenty years ago, while running an in-home daycare, I witnessed a heartbreaking interaction between a mother and her toddler. Her two-year-old little girl presented a scribbled picture to her mother. The mother responded in a cold, condescending way. Granted, most parents wouldn't dream of responding to their child in that manner, but it drives home a point. It's an extreme example. Honor your child's work and interests. Don't toss out a generic "Good job" at everything he does. Truly pay attention and offer a genuine compliment. "I love the way you mixed the blue and green together" or "That was a neat idea to use dots to create this tree!" go a long way to supporting, encouraging, nurturing your child's artistic interests. 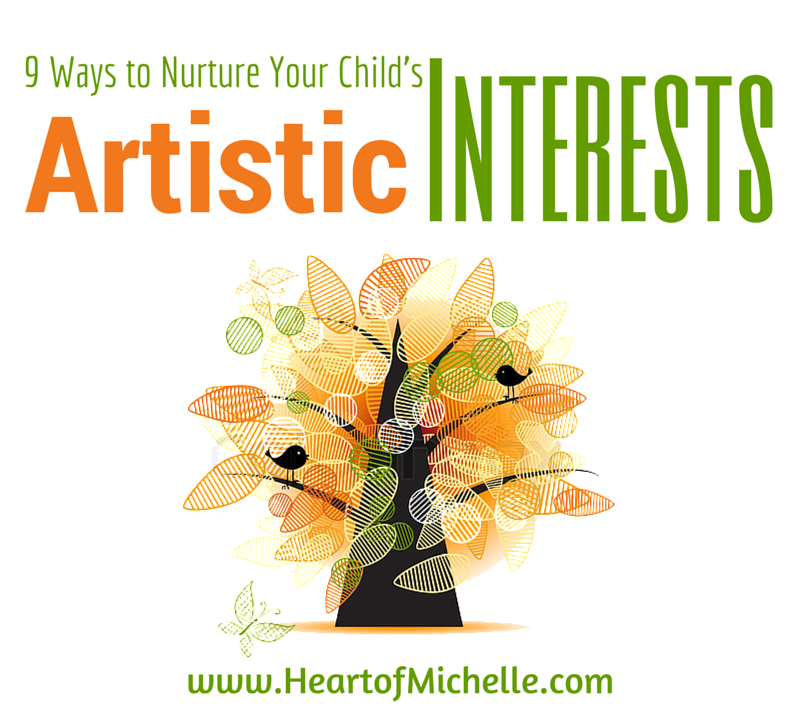 How do you nurture your child's interests in art? Share in the comments. 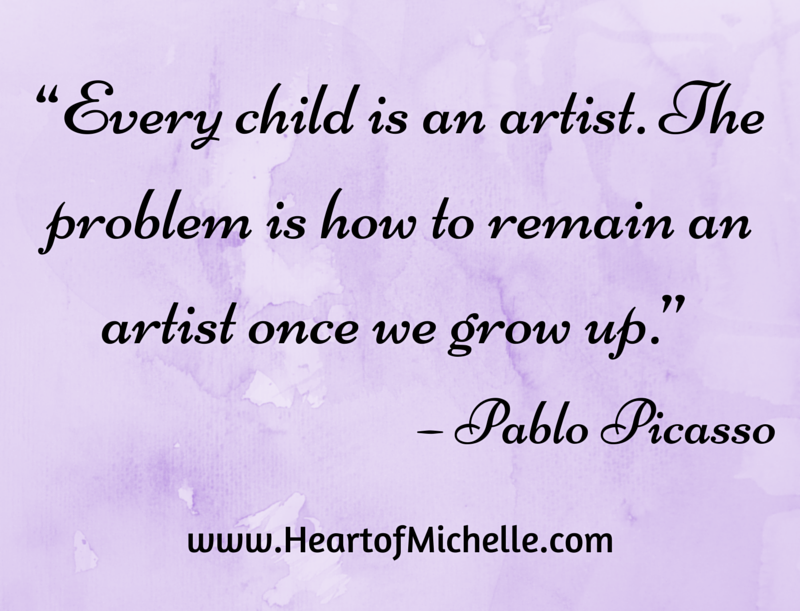 Come back tomorrow for to read How to Include Art across Your Homeschool Curriculum. Better yet, subscribe here so you don't miss any posts. This is the second post in my 5-day series on 5 Ways to Include Art in Your Homeschool. This series is a part of iHomeschool Network's Winter Hopscotch 2015 where you'll find more helpful homeschool posts. This is really great, and a post that I must pay attention to. Seriously! Thanks so much for sharing this at the Mommy Monday Blog hop. I love posts that are pro homeschool and help other homeschoolers, so much sure you stop by tonight to see if you are featured. Also, I am pinning this to my #homeschoollinkup pinterest board. Thanks so much for sharing!